Continental Arctic (cA): dry, very cold, very stable throughout, very low tropopause; source region is the North Pole; migrates south in winter, but summer migration modifies it into a Maritime Arctic mass. This airmass rarely affects the West Coast of Canada; instead it travels south across the prairies and further into eastern Canada. Continental Polar (cP): dry cold, fairly stable throughout, low tropopause (not found in Canada). Maritime Arctic (mA): moist, cold, unstable in lower levels, low tropopause; source region is Northwest Pacific; in moving south-eastward its moisture is released as precipitation west of the Rockies, and it reaches the prairies as relatively dry air. Maritime Polar (mP): moist, cool unstable, medium tropopause. Maritime Tropical (mT): moist, hot, very unstable, high tropopause; source regions are Caribbean and the Pacific; rarely appears in Canada in winter—when it does, it appears aloft. Continental Tropical (cT): dry, very hot, very unstable, very high tropopause; source region is desert area of the southern US; they never reach Canada in winter; in summer, they occasionally move northward up the centre of the continent. A cold front is a leading edge of an advancing cold air mass; they are marked on weather maps in blue, or in black with solid triangles. A warm front is the trailing edge of a cold air mass, marked in red, or in black with solid semi-circles. The name of a frontal system is based on the name of the colder air mass involved. From coldest to warmest, common air masses in Canada are: cA, mA, mP, and mT.1 Therefore, between cA and mA is the Arctic Front, between the mA and the mP is the Maritime Arctic Front, and between the mP and mT is the Maritime Polar Front. The movement of fronts is dependent on the motion of the cold air, and is independent of the motion of the warm air. Warm air overruns cold air at a warm front, while cold air undercuts warm air; both conditions produce frontal lift, but the lift is more rapid at a cold front. The movement of fronts revolves around what is referred to as a frontal depression or frontal wave. When warm air bulges northward, cold air migrates southward on the west side of the bulge, and this begins the anticlockwise circulation of a newly developed low or depression. The arctic or polar front is now composed of a warm front (northerly moving warm air), and a cold front (southerly moving cold air). At the peak of the frontal wave, pressure drops and surface winds increase. The cold north-westerly air always begins to undercut the warm north-westerly air and the two air masses begin rotating around the centre of the low (the peak). The cold front moves faster than the warm front, and eventually undercuts the warm front from the rear, causing the warm air to be suspended aloft—this is referred to as an occluded front, or occlusion. The front becomes joined again, and the now occluded low pressure diminishes. The cross-section of an occlusion shows three air masses, the cool on the left, the cold air on the right, and a trowal (wedge) of warm air aloft. The warm air ascends over the cold air in a long gentle slope. For this reason, and the fact that they move slowly, the clouds that form as a result can extend 500 or more nautical miles in advance of the front. The first sign of a warm front is high cirrus that thickens to cirrostratus and alto stratus. The ceiling gradually falls, followed by a long period of steady rain that may be as much as 250 NM in advance of the front. The air becomes moist and unstable and thunderstorms can be embedded in the stratus, producing heavy showers as the front nears. There may also be low stratus and fog. Warming temperature and clearing skies indicates the passage of the front. Relatively rapid wind change, associated often with stronger speeds. Gradual increasing temperature; more sudden aloft. Pressure will fall with the approach, and then steadily rise with frontal passage. Low ceilings and poor visibility lasting over a long period of time; when rain is created by the rising air, it is associated with low, irregular cloud bases; fog (precipitation-induced) is typically found 50 NM ahead of the advancing warm front. Begins when the rising altostratus layer reaches 8000’ to 12000’ AGL; precipitation increases as front approaches; occasional heavy precipitation is associated with embedded thunderstorms. Risk of embedded cumulonimbus that cannot be located visually, but generally less severe than when associated with cold fronts. The cold air undercuts the warm air in a much more violent fashion. The frontal zone is much narrower—only 50 NM typically. The frontal slope is much steeper as surface friction slows the lower leading edge of the front. The warm air is forced to ascend rapidly causing cumulus formations, and often thunderstorms with heavy precipitation—including hail—in a squall line. The more unstable the warm air mass, the more violent the associated weather. Rapidly clearing skies and falling temperature mark the passage of a cold front. Drop, usually suddenly, but the decrease may persist for a extended period of time as the leading edge of the front is warmed by the surface. With the passage of a cold front, pressure will begin to rise. Improvement in visibility after passage; if cold front is fast-moving, width can be as little as 50 NM, while a slower front can take hours. Frontal rain is narrow; risk of severe icing in cumulus clouds. This will vary, but anticipate rough air. Winds blow parallel to the front and weather is generally similar to a warm front, although less severe. As a depression advances, the warm sector becomes suspended in the cold or cool air; such fronts are also similar to warm fronts, with low cloud and continuous precipitation. The air mass is unstable and may contain embedded cumulus in the strataform cloud. Occur when advancing cold air meets even colder air and is therefore forced aloft; this is an upper cold front. The same may occur with advancing warm air that encounters cold air along the ground—this forms an upper warm front. A trowal is the wedge-shaped mass of warm air associated with occlusions. The weather associated with trowals are a combination of warm-front and cold-front weather. The clouds (strataform clouds) ahead of the trowal will appear as a warm front, while cold-front clouds (cumulus) appear behind. Importantly, trowals present a high risk of icing during the winter; icing will appear in the north-east sector of the low pressure system, and will extend between 50 and 100 miles ahead of the occluded front. This occurs whenever warm air is suspended above cold air. When the warm air is suspended above the freezing level, snow is produced; however, when the warm air remains above the cold air and above-freezing temperatures are aloft, there is a high risk of freezing rain precipitation (supercooled water droplets). An advancing freezing rain “belt” indicates rain aloft, and is usually preceded by ice pellets at lower levels, but this may not give warning at higher altitudes. This situation is typically associated with warm fronts in winter. the air mass simply becomes saturated as it acquires more moisture from an external source (over bodies of water). Of these two methods, however, adiabatic expansion is the more common. Remember that air can be forced to rise by orographic lift, convection (caused by warm surfaces whereby the expansion of the air causes heating) frontal lift, turbulence, and convergence. Visible vapour forms around condensation nuclei—dust, smoke, salt, pollution particles—and can combine to form raindrops (coalescence). In stable cloud there is insufficient lift to cause a great deal of coalescence and the water particles fall to the ground as drizzle. These can freeze to form freezing drizzle. Large cloud masses have three distinct regions: an ice crystal region near the top where the vapour sublimates into ice crystals; a snow and supercooled water-droplet (SCWD) region where the two co-exist; and the lower water region, composed of water droplets. Hail originates in the middle region where the SCWD and ice collide, to form a frozen mass with air in the centre; as this mass falls through the lower region, water freezes on the mass to form hard transparent ice. This process can be repeated many times as lift can again carry the hail back up to the middle region, forming large hail stones. If the lower water level is thin, snow pellets form. Fog is cloud, usually stratus, in contact with the ground; its appearance is associated with high relative humidity, a narrow dewpoint-temperature spread, and some form of cooling process that initiates the condensation. A mixing action by wind is required; without wind, fog is unlikely to form—instead, dew will appear. It more likely occurs in coastal areas. It is common in industrial areas because of the high concentration of particulate; the sun heating the earth below dissipates it. Radiation Fog: Appears on clear nights with light winds; the ground is cooled by radiation and so is the air in contact with the ground; commonly referred to as ground fog, it tends to settle in low-lying areas and normally dissipates a few hours after sunrise which stops the radiation effect. Advection Fog: Caused by the drifting of warm humid air over cooler land or sea surface; it may persist for days and is associated with coastal areas as the cool surface may not be affected by daytime heating, and spreads over land in association with sea breezes. Upslope Fog: Caused when air cools as it is forced to move up a slope. Steam Fog: Caused by cold air passing over the surface of warm water and the evaporation of the water; it occurs over water bodies typically in the fall. Precipitation-Induced fog: Caused by the additional moisture in the air due to the evaporation of rain or drizzle; it is associated with warm fronts and is referred to as frontal fog. Ice Fog: Forms in extremely cold and calm conditions and is caused by sublimation associated with fuel combustion. Visibility: distance at which prominent objects may be seen during the day or lights seen at night. Flight Visibility: the average range of visibility forward from the cockpit. SlantRange Visibility: the distance a pilot can see over the nose of the aeroplane towards the ground. Ground Visibility: the visibility at an airport as seen by an accredited observer. Prevailing Visibility: the distance known objects are visible over at least half the horizon. Runway Visual Range (RVR): (for your information only) the distance a pilot will be able to see the runway lights or delineating markers from the runway centre line at the point of touchdown; it is recorded in hundreds of feet by a transmissometer installed adjacent to the runway and is provided to pilots if RVR 6000 (feet) or less is recorded. Visual Meteorological Condition (VMC): flight conditions (visibility, distance from cloud and ceiling) are equal to or better than VFR minima. Instrument Meteorological Conditions (IMC): flight conditions below VFR minima. IFR Conditions (Instrument Flight Rules): ceilings less than 1000’ AGL or visibility less than 3 statute miles (sm.). MVFR Conditions (Marginal Visual Flight Rules): ceilings between 1000’ and 3000’ AGL and visibility between 3 and 5 sm. VFR Conditions: more than 3000’ ceilings AGL and visibility more than 5 sm. Thunderstorms can form when the air is unstable, there is some form of lifting action, and a high moisture content exists. The violent action associated with thunderstorms is caused by the formation of chimney-like structures in cumulus clouds based on convection currents. As the superheated moist air rises rapidly, an equal amount of cooler air rushes down to replace it. The active currents combine to form thunderstorm cells. Thunderstorms have three stages: cumulus, mature, and dissipated. In the cumulus stage, there is no precipitation, but the rising and falling currents have started; in the mature stage, the towering cumulus develops into towering cumulonimbus, and may reach as high as 60,000’. Updrafts can exceed 6000’ per minute and the water droplets grow large enough to drag air downward. The downdrafts can reach 2000’ per minute. The mature stage, marked by the appearance of precipitation, typically lasts 15 to 20 minutes, but may last for an hour. Lightning, microbursts, gust fronts, wind sheer, hail, and tornadoes are associated with the mature stage. In the final dissipation stage, the precipitation cools the lower region of the cloud and the cell loses energy; downdrafts spread throughout the cell, except the upper portions; the top forms an anvil structure. Individual thunderstorms are usually no more than 10 NM in diameter, but many can form clusters at various stages covering vast areas and lasting for hours. There are two forms of thunderstorms: (1) air mass thunderstorms, which form singly or in small clusters on hot summer days—they are usually scattered and surrounded by VFR conditions; and (2) frontal thunderstorms, which are associated with cold fronts and sometimes warm fronts, can form a line hundreds of miles in length. A microburst is a narrow down-burst less than 2 NM is diameter and reaches peak winds in less than 5 minutes; they can have wind speeds as great as 6000’ per minute. When they hit the ground they form horizontal winds as high as 80 KTS. They may exist as far as 10 miles from the storm cell. Don’t fly through a thunderstorm. Detour around thunderstorms as early as possible, staying at least 5 miles from the overhanging cloud mass to avoid hail. Avoid landing or taking off in the vicinity of thunderstorms. Use airborne dust and debris as a visual indicator of gust fronts or microbursts. Ragged clouds from the cloud base can indicate tornado activity; if one appears, expect more. Do not fly under a thunderstorm, even if you can see the other side, especially when the formation is caused by orographic lift. Reduce power to manoeuvring speed minus 10 KTS. Do not attempt to fly a narrow gap between cells; if the distance is several miles, fly at a high altitude. When flying around a thunderstorm, fly to its right, as the winds will be more favourable. If forced to penetrate a cell: keep a constant heading that will get you through in a minimal amount of time; reduce airspeed to minimize structural stresses; turn the cockpit light full bright to minimize lightning blindness; turn on the pitot heat and carburettor heat; secure seat belts; secure loose objects in cabin; try to maintain a constant altitude and power setting—anticipate erratic airspeed readings caused by drafts and water in pitot tube; avoid unnecessary manoeuvres; determine the freezing level and avoid the icing zone; do not use an autopilot. If the aircraft in temperatures at or below freezing strikes a supercooled water droplet, it will adhere to the airframe. As it strikes the airframe the droplet releases heat as it freezes and that can raise its temperature to 0° C. and therefore spread before freezing (producing clear icing conditions), or it may freeze on contact (producing rime icing conditions). Clear ice is heavy and alters the lift characteristics of wings; rime ice appears frost-like, is light, but also alters lift. The higher the temperature of the aircraft skin, the more the droplet will spread from the point of impact. The amount of supercooled water in a cloud increases with height when the temperature is just below freezing, but decreases with height when the temperature is well below freezing. The larger the droplet, the farther it will spread before freezing. The rate of catch increases with airspeed. Thin wings catch more droplets than thick wings. 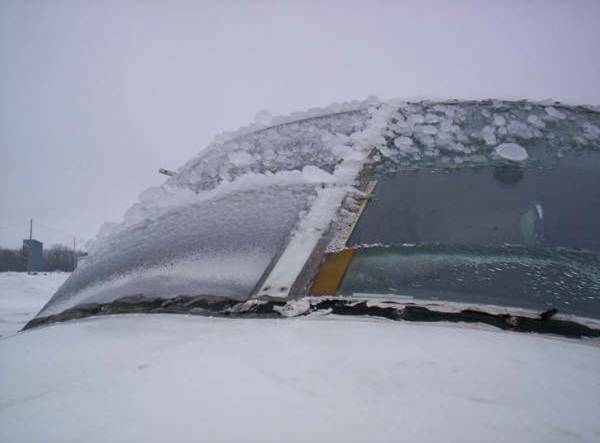 The first sign of ice accumulation appears on surfaces with leading edges: antennas, prop blades, horizontal stabilizers, rudder, landing gear struts and, most useful for detection, the outside temperature probe. 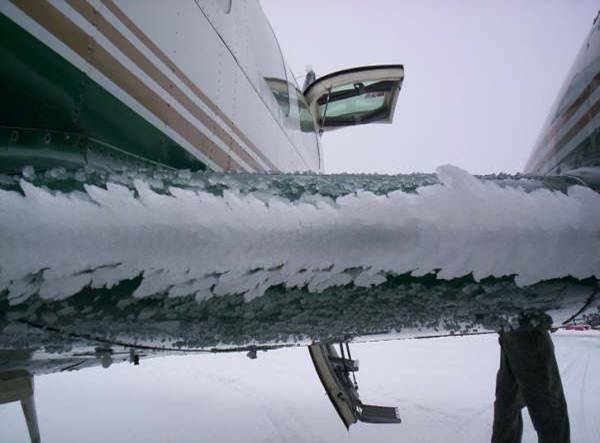 Gradual loss of power and the onset of engine roughness indicate ice formation on the prop. Ice first forms on the spinner and then spreads to the blades. The ice accumulates unevenly on the blades, creating stressful vibration and possible failure. On the lifting surfaces, ice changes the lift characteristics, increasing drag and increasing the stall speed. Combined with decreased thrust from the iced prop, the pilot is forced to apply full power and a high angle of attack; as a consequence, ice then accumulates on the under surface of the airframe. When landing an iced aircraft, a high power and high speed approach should be made. A blocked pitot tube and static pressure vent can cause failure of the altimeter, airspeed indicator, and vertical speed indicator. Ice on the antennas can destroy communication and navigation. Impact ice can block the air intake. In short, icing is very bad news. Severe icing is likely to occur in upper half of heavy cumulus clouds approaching the mature cumulonimbus stage, especially when the temperatures are between -25° and 0° C.
In “severe” icing conditions, a change in heading and altitude is essential; in “moderate” icing, a diversion is essential; “light” icing is usually not a problem unless the aircraft is exposed for a long period of time. In the event of icing, a decision to leave the ice-forming layer must be made rapidly once icing appears. The situation may become critical in a matter of six minutes. Turn around. If not possible, because icing is associated with horizontal temperature layers, the second choice is to climb or descend from the icing layer. Descending can be dangerous unless warmer temperatures are known to exist below, and there is sufficient ceiling and visibility. Use the radio quickly to obtain weather information. Avoid known icing conditions; get a weather briefing before your flight. Do not fly in rain or wet snow when the temperature is near 0°C. Slow the aircraft down; the faster you fly, the greater the distance flown in icing conditions and the more moisture encountered. Anticipate a higher stall speed if icing has accumulated; avoid steep turns. Anticipate higher fuel consumption with accumulated ice; land faster and keep power on during the landing. In the Juan de Fuca Strait, sea stratus tends to develop in the summer, topped at between 1500’ and 2000’ AGL, and sea fog in the fall, topped at between 1000’ and 2000’ AGL. There is likely to be more morning fog in the San Juan Islands than the Gulf Islands. The offshore stratus typically moves inland over several days and is more reluctant to dissipate. It is common to see stratus lying just offshore Victoria Airport, concealing the Gulf Islands; fog banks lying over water east of Victoria Airport can be blown over the runways with seabreezes. Langley and Pitt Meadows Airports prone to radiation fog in the fall due to surrounding low, flat bog land; this problem does not occur at Abbotsford Airport. South-easterly winds at Langley Airport tend to be the gustiest, owing to the 400’ ridge to the east, south-east, and south of the airport. Strong southerly winds aloft tend to develop over Langley Airport, especially in the winter months, with the winds at the surface being calm; since the Langley calm-wind runway is Runway 01, it is not uncommon to have a tail-wind aloft, which falls off to zero only a 100’ to 200’ above this approach end of this runway. Weak surges of sea fog from the Juan de Fuca Strait affect both Vancouver and Boundary Bay Airports, but Boundary Bay Airport will likely clear in advance of Vancouver Airport owing to subsidence behind the Olympic Mountains; fog developing inland as a result of advection can quickly sock in the weather at Boundary Bay Airport. Some of the worst icing conditions have been reported over Vancouver’s North Shore Mountains. South-easterly winds and Vancouver Airport tend to be the gustiest, while the strongest winds appear when westerly winds develop—the westerly winds, however, tend to be stable and relatively smooth. The worst weather occurs in the Fraser Valley during the months of September through April; heavy precipitation can bring about rapidly lowering ceilings and visibility. From west to east, the clouds noticeably thicken near Agassiz and worsen as you proceed eastward towards the mountains. South-westerly flow produces a “pile-up” of weather along the mountains, with higher ceilings along the south side of the valley. In the event of outflow winds, watch for significant turbulence below 5000’ ASL from west of Hope to Chilliwack and Sumas Mountains. Strong summer sea breezes channel through the valley between Chilliwack and Hope, typically producing winds 20 to 30 KTS. Smog topped at between 1500 to 2000’ AGL can reduce visibility to between 2 and 3 miles at the east end of the valley during warm, summer afternoons. Expect strong winds over Harrison Lake during the summer, with the worst winds appearing as northerly winds during summer afternoons. Low clouds can build over Kamloops Lake, but usually dissipate near Cache Creek. In periods of poor weather, beware of the “sucker hole” at the west end of Kamloops Lake where a pilot could turn up Deadman Creek, which initially looks good, but is associated with rapidly rising terrain. This is the primary route to enter the interior from the coast. If the weather makes Hope impassable, then it is likely that the route weather as far north as Boston Bar will be impassable. Patchy fog will appear in the Fraser Canyon south of Lytton during the fall and winter; the fog develops overnight and is slow to dissipate the next day. Although strong winds are reports commonly from Lytton, turbulence is rare; if southerly winds occur in excess of 30 KTS, expect severe turbulence near Lady Franklin Forck (across from the Yale Tunnel). Little turbulence has been reported over Boston Bar, even when the surface gusts exceed 60 KTS, but expect turbulence near Lytton Airport where the wind flow is split into the Thompson and Fraser River Valleys. If the weather at Hope is impassable, then the Hope-Princeton route west of Allison Summit is likely impassable. A particularly treacherous area is found at Hope Slide as the barren hillside reflects light, particularly when covered in snow, creating the illusion that the clouds are “brightening” and the potentially deadly false assumption that conditions ahead are improving. Steady precipitation along this route can cause a rapid fall of visibility—it has been reported that the route can close up in as little as 10 minutes. Westbound traffic is commonly forced to descend near Skagit Valley—the problem being that the poor visibility and low ceilings will continue. Eastbound traffic should only pass Hope if with sufficient altitude to safely cross Allison Pass (based at 4350’ ASL) as east of the Skagit River after which the valley terrain rises rapidly to the summit—so rapidly that the gradient exceeds the climb capacity of most general aviation aircraft. A double-whammy is derived from the fact that the valley rapidly narrows, making any safe turn dangerous or even impossible. Same as the Hope to Princeton route and equally undesired, with the added discomfort of low level turbulence south of the Coquihalla Summit through to Hope. Experienced pilots know you do not try an “en route” climb out of this valley owing to the rapidly rising terrain—instead climb southbound to ensure terrain clearance before turning westbound. Watch this one as the weather often looks good for traffic entering the Rogers Pass from the east—getting to the summit of the pass does not assure passage to Revelstoke as low cloud tends to pile west of the summit point. Watch the winds and turbulence along the route from Sparwood to Blairmore, with winds up to 80 KTS not uncommon—many aircraft have been forced down by severe turbulence near Blairmore. Can you see the “Capt.” in “c A P T”—thanks Tom Larkin. My discussion regarding the local B.C. weather is based on comments, descriptions and analysis by Kent Johnson and John Mullock in their Aviation Weather Hazards of British Columbia and the Yukon (1996, Kelowna: Source Graphics and Print Co. Ltd.) This book appears in the Recommended Texts section for this course and, in view of the unique and frequently hazardous weather pilots experience on the west coast of B.C., this book is a worthwhile investment.